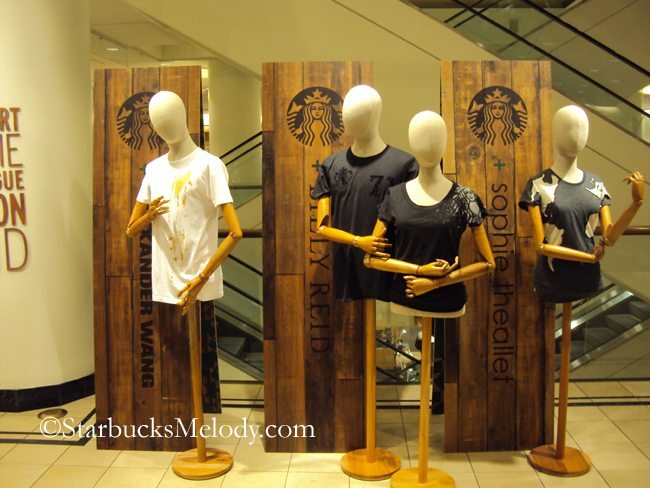 From the My Starbucks Idea blogs: Starbucks Designer Tees. The display and correct department were not hard to find at all. There is a large display right near the escalators showing off these t-shirts. By the way, the three t-shirt designers were Sophie Theallet, Billy Reid, and Alexander Wang. It appeared to me that the solid white shirt by Alexander Wang, and the black shirt that has “71” on it (by Billy Reid) were styled and cut as men’s shirts. 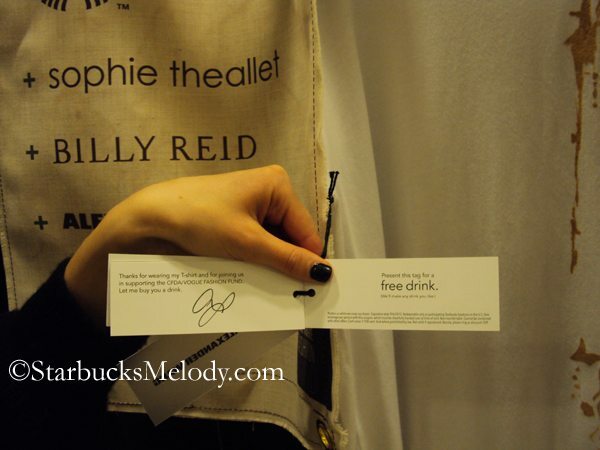 The Sophie Theallet shirt and that the other black Billy Reid shirt (the one with the Starbucks siren on the left shoulder) appeared to be women’s shirts. Of course, I recognize that t-shirts are t-shirts, and anyone can buy any one of the four they like! I tried the black Billy Reid t-shirt on, and it seems to run just a bit small. Nordstrom did not have my size available in store (they seemed to have just a handful of shirts) and so I ended up ordering the t-shirt with the assistance of the sales associate. She was incredibly helpful, and even waived the shipping fee for me. I have to be brutally honest here: I think the price tag is a little steep for these t-shirts. I recognized that these are designer shirts, and placed in a Nordstrom department where the typical via C customer would be accustom to spending a few hundred on a single sweater, or pair of pants, but for my budget, this was a touch expensive. In looking around at other items in the same area of Nordstrom, the t-shirts were priced at the same scale as all the other beautiful high-style designer merchandise in via C. Still, $85 is more than I would normally spend for a t-shirt. And I totally recognize that there IS a whole category of folks who will spend that for designer wear, but it’s a bit much for me. In addition, this blog post has a boring legal section to it too! I received one of these t-shirts already as a gift from someone at the headquarters. I think that the Federal Trade Commission requires me to disclose any products or services in connection with a blog article. I received a free t-shirt. Technically, I think the intent of the FTC is that the requirement is disclosure of “compensated endorsements” and I didn’t really review the shirt that was given to me, and I did not do a “product review” at the behest of Starbucks, but just to be safe, I’m disclosing that I received a free Alexander Wang shirt. In any case, I’ve probably just caused someone at the SSC to wince a little by referring to the shirts as expensive. They are beautiful shirts though! So what do you think? Have you seen these shirts at your local Nordstrom? I too am very disappointed that the price of the tee shirts is so high. I buy clothes from Nordstrom and especially go to the Rack, but I am sort of suprised that SB would market these tees at such a high price. To me it sort of defeats the purpose of the promotion. I was looking forward to purchasing one, but am not inclined to buy one at that price. Anyway, I like some of the tees more than others, but I would NOT be paying $85./tshirt, no matter what. I did really like the grey hoodie (not shown here) they are offering..also for $85.,, but if it’s substantial…I think that’s not so uncommon for a hoodie. And, that’d be something I could actually wear thru-out the spring and alot of the fall. I’m going to a Nordstrom here this week, will see if they have them but am thinking they don’t,….based on that “Seattle and NYC” statement. So, I like (some of) the tshirts, really like the hoodie, think $85. is absurd for a tshirt. I also think they need to go back to putting a free coffee coupon in all their drinkware when it was sold in the cafes. It’s a nice touch, adding this free drink coupon to the $85./tshirts but really? you’re already paying for the drink. Denise I agree with you about putting the free drink coupon in the tee shirt. Actually come to think of it you are paying for more than one drink!!! 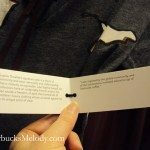 And it some ways I actually think it somewhat insulting to put a free drink coupon in with the tee shirt. @Denise – I am in a horrible hurry this morning, but I want to make clear that these t shirts are totally separate from the ones that I saw at 1912 Pike Place. Starbucks has sort of exploded with t shirts and it appears to me that there are 3 totally separate ‘groups’ of t shirts. (1) High end fashion shirts at Nordstrom for $85 – These will probably come and go fast! I bet it is a one time experiment by Starbucks. (2) Normal priced hoodies and shirts avail at 1912 Pike Place and 1st and Pike or some store in NYC or online – Those are very different shirts than these fashion shirts. (3) the array of t-shirts, ever changing, that have ALWAYS been available to partners through coffeegear.com, and the only way a customer can get them is through the merchandise store. These are normal priced shirts too. That coffeegear store has always had t-shirts, logo pens, you name it. That IS where all the logo stuff was always found, up until just recently. There was no #1 or #2 for a long time. And if a partner has a t-shirt that says Starbucks on it, more line than not, it was produced by the folks who do the coffeegear.com stuff. — I have a blog post coming up again about that store. Very interesting move. I would be very interested in reading John Moore’s take as this appears to be a move to regain aspirational status instead of more down market cookie cutter moves of the past. @Melody: I understand these are ‘unique’, special tshirts, special offering etc. I have one of the “regular” “Sbux first store” t-shirts, sent to me a few yrs ago from an old friend who lives out there. I did read all about this at Sbux.com or, as I said, somewhere (Ideas in A.) on msi. I know this is an “exceptional” offering, so to speak. I’m actaully not sure why you seem to think I may have been confused? about some of it? at least, that’s how your response sounds. Maybe I’m missing something…..or maybe my original comment was very unclear. and, I agree with you: I’m sure these ‘special’ t’s will sell out in no time, if not already. @DeniseR – LOL – I’m laughing. This is what I get for only just skimming your comment. It is 8:45 and I’m trying to meet a friend at 9:30, and I really did not carefully read what you wrote! I am sorry! My bad! I am certainly not a fashionable person, i dislike the coffee spill shirt. The other ones are OK, but not something i would pay 85$ for! for me the math comes to – i spend 100$/month on starbucks, so that would cost me about a whole month of drinks! I am not sure if I missed it, but are the proceeds from the sale of this clothing going to a special charity that the Fund supports? Also, are these tees only going to be available in the fall or until they are sold out? @kitenarie: no puffed sleeves on that t-shirt…..as far as I have seen and description (elsewhere) read. @purple1: don’t know about the ‘funds” issue but I do believe it’s (whatever it is) all availbale @Sbux.com store. ? I am also a Starbucks freak. I love all things bux and even have a sbux watch a partner gave to me that I treasure. That being said, I went to a Nordstroms to look a the shirts and wasnt interested in the guys shirt. The coffee spill one, which is unisex, was on a female dummy at the one i went to and it just looked more fit for a female to me. Even so, $85 for a white t-shirt with a coffee looking stain was just too much. it makes me sad because I am such a fan but these just weren’t for me. @CD – That was an insightful reply. I think that Starbucks would love to partner with Nordstrom in almost any way possible, for that very reason. In the mid 1990s, there was a closer Nordstrom – Starbucks relationship. Nordstrom has never gone through massive expansion and licensing and has retained some of its exclusivity and prestige. Sure, it has changed a lot, but it is still the gold standard for customer service. I think Starbucks like the Nordstrom glow, and loves to bask in it, however possible. I may be over-stating this, but I really think you touched on some spot on points in your comment, and I too would love to know what John Moore thinks of this relationship. @Kitenarie – No puff sleeves on any of the shirts. @Purple1 – I get the impression it is just a limited run of shirts, and when they’re gone, they’re gone. I suspect this is a one time thing. @Chase – What about the shirt that says 1971 on it? That would be a nice one for a guy. But no matter how you slice it, $85 is a lot for a t shirt. @Purple1 – I forgot to mention, I do not think any of the money is going to a non-profit or something like that. I think these are just designer shirts, designed to appeal to the customer base that would normally look for very high end styles by famous fashion designers. When I was at Nordstrom, I saw a sweater near the shirts that I thought, ‘oh I like that’ and glanced at the $280 price tag, and thought, ‘that’s a bit much for me for a sweater’ but there are large groups of people who spend like that. Suzanne C love your comment! I guess I just wonder why they are making the cost of the tees so high? I agree that having a Nordstrom/SB joint venture is a good move especially as you say Nordstrom’s customer service shines, but in the end it will be interesting to see how many tees they sell. Possibly, could this leave a sour taste with SB customers? @Suzanne C Ha!! I didn’t even notice that…but you’re right 😉 I have to admit while I REALLY want a Starbucks shirt, it’s not one of these. I think the drink coupon is a nice touch, but I don’t know about the white ‘coffee stain’ shirt. 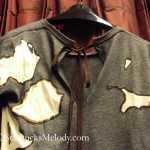 I feel like I potentially could do that to my shirt every day and be upset about it! 😉 Therefore I can’t in good conscious intentionally buy one! Alas, though I collect most things Starbucks, the price on this is a bit too steep for me. @Suzanne, Hayley, and Purple – I totally laughed out loud when I read Suzanne’s comment. So good! @LatteRose – Maybe they’ll eventually end up on sale or over at Nordstrom Rack??! The 71 shirt was okay, but for $85? It just has a felt logo and a 71. It isn’t a *bad* shirt but I’d probably pay $20-30 for it, and I *am* the type of person to spend $80 on a shirt – it’s just this isn’t really appealing to me. I feel like it isn’t all that creative. I could make a shirt, like this, for a lot cheaper. I was just kinda sad I couldn’t spend more money on starbucks stuff to wear, I suppose, but at $85 I could buy 2 button up twill shirts for work from the partner website! 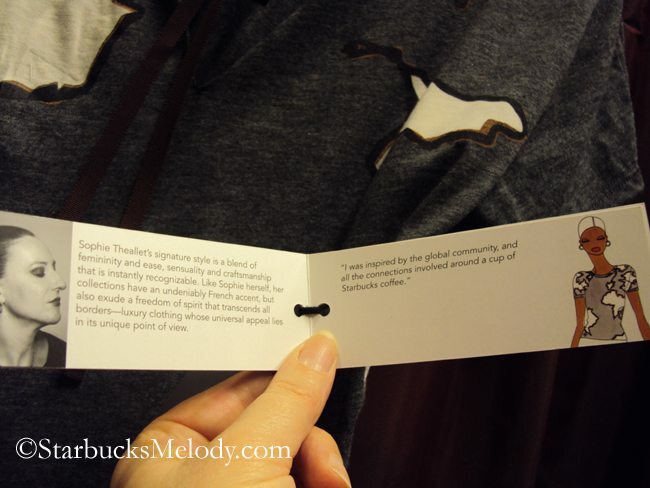 Great information on Starbucks inspired tees that are available online and at select Nordstrom locations. The tees look spectacular, too. However, even though I love tees, I wouldn’t purchase tees in the price range, though. Perhaps better pricing will allow others to partake of Starbucks inspired tees. @TheBaristaGuy – Right on. 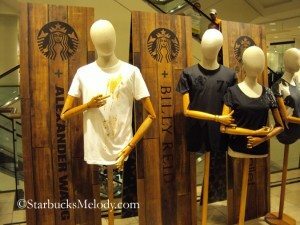 I think it is fun idea to have the t-shirts, and two of them really do appeal to me, and I like the premier partnership with Nordstrom, BUT it doesn’t seem like a promotion that is geared to any normal Starbucks customer. 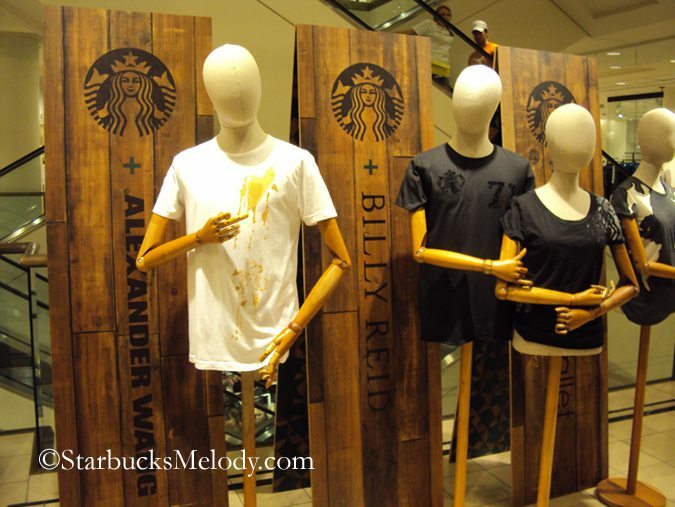 The bulk of Starbucks customers are not going to spend $85 on a t-shirt. And I’d love to know if ANY partner sees a free drink coupon from the t-shirt come through their store. Maybe there is a way to come up with an $85 beverage. 😉 LOL! I have not yet seen these, but I love the one that looks like it has coffee spilled down the front of it. However I completely agree that the price is a little much (at least for the average consumer) and I can’t afford one now. @Melody Sorry for the double post, but i have seen videos on youtube of people order $15 drinks that have like 14 shots of syrup in it, so and $85 drink must be CRAZY! 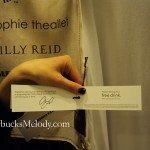 I too would be interested to know how many people redeem the free drink coupon from the purchase of the tee. I also wonder if SB reads these comments and sees that the price of the tees is way too high and they have lost a big chunk of customer support because of that. I have to check out Nordstrom Rack to see if any tees end up there. As long as we’re going on about these, I actually think I could tie-dye something very similar to that coffee-spill one. 😉 Of course, my name is not that of a “designer”. I do remember yrs ago (early-mid ’90’s) when Nordstrom served Sbux coffee in their restaurants and walk-up-espresso bars. That was a big draw for me…to have a good lunch at Nordstrom WITH good coffee, which happened to be Sbux. I better just end this…! These are awesome shirts! $85 is a little steep for me, though. I better stick with the online barista clothing store. LOL. ok! here is weird!!!! 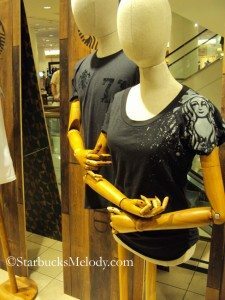 today I went to Nordstrom (for other shopping…not Sbux) but thought I would see if they were carrying these tshirts……they were not (this was Woodfield, nr Chicago, but, I was told, they are carrying them in the Chicago Michigan Ave store). So, that was that. I got what I went for, looked around, had lunch with a friend in their cafe (still very good coffee, altho not Sbux) came home..in the pouring rain. @Denise – That’s so cool you got the hoodie! You’re on a winning streak, between the great Yirgacheffe poster and the hoodie! The two stores here in Seattle that have the OTHER t-shirts/hoodie only have the tees and not the hoodie. I’m referring to items available at starbucksstore.com – I know we’re on the same page. I have been dying to see what the hoodie looks like up close and personal, and thinking about ordering it. You should post a hoodie pic on the fb page! 🙂 Congrats! I picked up a few of the shirts- 2 for me, and 2 for other friends. 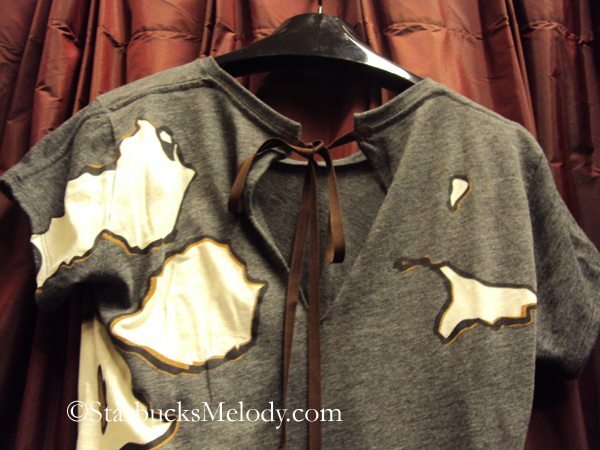 On a recent visit to Texas, I received numerous compliments- and this was before they discovered it was a Starbucks’s shirt! Once people realized that they were, the were happily surprised. I was also sticker-shocked, so I only handwash and lay flat to dry. The ones that I gave for gifts were greatly appreciated as birthday gifts. (I assume anyone buying a tshirt like this for $85. I better stick with the online barista clothing store. The coffee spill one, which is unisex, was on a female dummy at the one i went to and it just looked more fit for a female to me. about some of it?